One thing we are working on is to offer more selection in our line. Although we have some contemporary designs, we've tended to lean toward more traditional styles. This is not to say that you could not get a modern feel from a traditional chair. Just by selecting the right fabric a chair could look either traditional or contemporary. For example, a dining chair with a toile on it would look very different than one with bold colors and geometric shapes. Several customers have suggested styles they would like to see and these week introduced two new chairs with a nod to the modern. 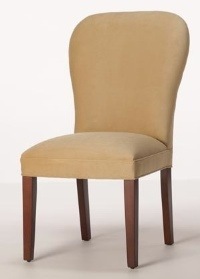 The first is the Modesto Dining Chair. It is really a departure from our past products. The flared, concave back sets this one apart from the rest of our line. 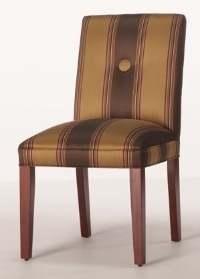 The other new chair (Fresno Dining Chair) has many of the great features of contemporary designs. It is very symmetrical with a short back and crisp lines. The linear layout is broken by a single large button on the in-back. I really love the look of this chair. I'm not sure what it is, but I'm reminded of a freshly pressed pair of pants with its nice, straight creases. Of course, we will be introducing even more news styles in the future. As always we want to here from you with any suggestions.